Since this year we decided to write our reports also in english. With the excellent ninth overall rank, from 113 starters, the Tyczka Totalgaz rally team celebrated a gratifying seasonal end. Annually the best pilots of the national rally scene meet at the rally ADAC Frankish Switzerland in Hollfeld to choose on selective special stages in a wonderful landscape the quickest pilot. Sandro Wallenwein took the chance to take his only 16-year-old sister Eve for the first time as co-pilot in the rally-car. 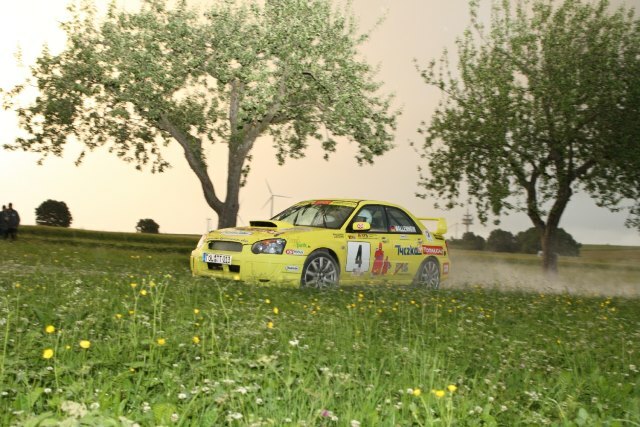 With big input the german vice-champion maneuvered the yellow Subaru Impreza. On the first stage he made a really rare driving mistake and lost many seconds to the competitors. From now on the forwarding agent from Stuttgart crowed with consistently quick times and improved his position from rank 42 up to the 9th overall rank after special stage 5. Together with his sister Eve on her rally baptism they won the class of alternative fuel in superior style: “We really had a lot of fun! There is no doubt that this event is one of the best rally 200. A good mood took place on the winners ceremony in the townhall of Hollfeld. It’s good example for organizers of other rally’s. Eve found pretty quick her place as co-pilot and did a great job. Directly after we passed finish of the last special stage she told that this would not be her last rally. I guess the rally virus infected the next Wallenwein …”, Sandro sayd with a smile after the finished the rally. “Within the next weeks we like to start the plannings for the next years season. It’s our wish to bring a new rally-car powered with LPG to the start. We can well imagine to start with this car within the Germany Rally Championship, but for the moment there is no authorisation to make points for vehicles powered by alternative fuels. It makes no sense to start in the german championship generally when there is no incentive on the mastership. In times of shrinking starter fields the DMSB should immediately deal with these problems. I’m sure that when it’s possible to reduce the applicationcosts on fuel, several teams will think about a change or a entry in the series. We stand behind this project and we like to continue on it.” Says Thomas Wallenwein, long time rallyedriver and teamboss of Wallenwein Rallye Sport. In tradition the Tyczka Totalgaz Rallye Team will start at the end of season at the ADAC Rallye Fränkische Schweiz (Rally Frankish Switzerland) in Hollfeld on Saturday, 24.10.09. On last weekend Sandro Wallenwein defended the vice champion title in the German Rally Championship (DRM – Deutsche Rallye Meisterschaft). To the 31st issue of the “Frankish” he celebrates a premiere with the LPG powered yellow Subaru. For the first time his 15 year old sister Eve will take the place of the co-driver in the rallycar and tell him the right way on the challenging special stages. “The rally is one of the most popular 200th-rally events in Germany. Also this year again more than 130 participants are expected. Within the competitors field a lot of strong group H cars take place, which have a extremly good weight-power relation. Hard to say on which position at least we finish the rally. The special stages are not known to me and Eve takes the first time place in a rallycar, so to have fun stands absolutly in the foreground …”, so Sandro, which surprised his family just a few days before with this new team constellation. Start of the rally is on Saturday at 12:o1 hrs on the sportsarea of Hollfeld. First car is expected to finish at 15.36 hrs. In between 5 different special stages must be successfully completed. The winner ceremony will be part of the infamous special stage 6 within the town hall of Hollfeld. As usual this will take long till next morning ….. The summerbreak slowly bends to the end. 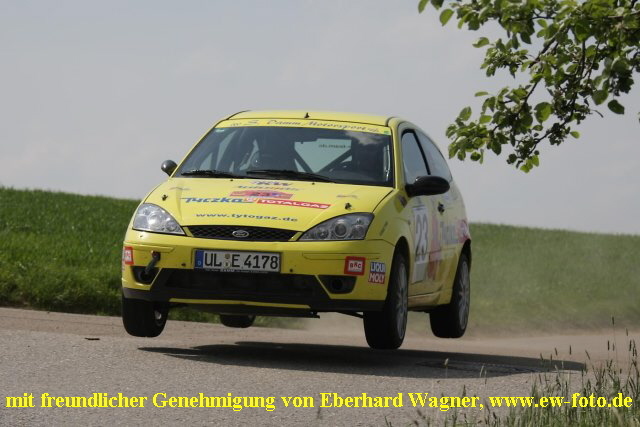 The AvD Rallye Niederbayern (Rally Lower Bavaria) already on coming weekend (29th August 09) stands on the programme for the LPG powered Subaru. After the positive results on the last competitions the Tyczka Totalgaz Rallye Team and Wallenwein Rallye Sport are highly motivated and would like to be part in the top flight once again. After a regular run on the starting places the organizers had to increase the field which was originally restricted to 80 participants. More than 100 participants sprinkled all expectations. Beside a run to the German Rally Series (Deutsche Rallye Serie – DRS) like already in the past this event counts also in this year to the Austrian Rally Challenge (ARC). With startnumber one the former Group N world champion Manfred Stohl opens the hunt on the wonderful stages around Außernzell in the middle of the bavarian forest. Sandro Wallenwein starts with his LPG powered Subaru in the class for alternative fuel which is, for first time in this season, good filled by five vehicles. Due to temporal reasons Pauli Zeitlhofer is not able to start with Sandro on this event so that Marcus Poschner will take the place beside him and show the right way. To the joy of many fans there is a reunion with Ellen Lohr and Jenny Gäbler who will line up in a Subaru Impreza N12 of the Swabian team Wallenwein Rallye Sport. “I know the special-stages from 2006. At that time I had a lot of fun on this very fast stages with a Skoda WRC. If one liked to compare this rally to the roundtrack, it comes close to the characteristic of the world famous Nürburgring Nordschleife. It goes constantly uphill and downhill. Further we reach very high speeds. If you should lose concentration for one time, you find yourself fast off the tract. Unfortunately several pilots make this experience every year …” so Sandro Wallenwein to the peril of this event. “Olaf Dobberkau, Maik Stölzel (both Porsche 911) and Uwe Nittel (Fricker Mercedes) with their rear-drive vehicles will be hardly to beat on dry road conditions. On changeable weather conditions Manfred Stohl in the Subaru as well as Rainer Noller and Ulrich Kübler in their Mitsubishi’s will lead the field. With a constantly speeding driving we want finish the competition again within the top 10.” if his appraisal is to the relative strengths. The event contains 13 specialstages with more than 140 kilometres on best time. The rally starts on Saturday morning 08.18 hrs on Außernzell’s main square, were the winner will roll on the ramp at the evening on 20:o4 hrs. Our teamboss Walter Farkas followed up a invitation for social purpose brought to us in 2008 from the municipality of Krekel. Our everywhere popular pensioner VW New Beetle was the secret star on the annually village- and child-party in Krekel in the Eifel. On the 6th and 7th of June, we could contribute in spite of exceedingly bad weather something to the success of this party. 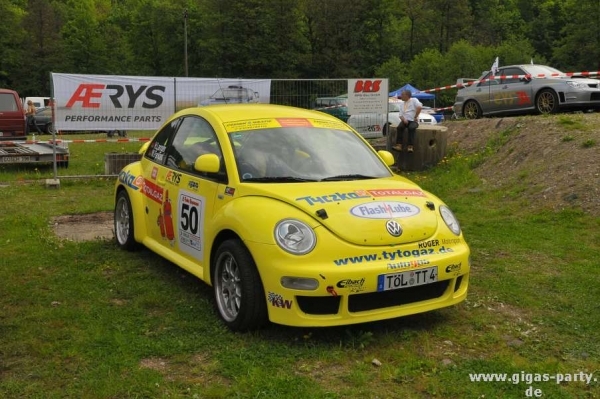 One of the coorganizer of this event, Peter Meurer of our sponsor FAS had the idea to give a understanding to the children what rallysport means on a selected stage with our Beetle. Taxi rides with our Beetle were offered against payment of a small donation in favour for the municipalities kindergarten. Then in quick one, the weather conformist tempo two rounds with the small passengers, considering the necessary security, were carried out in each case. The enthusiasm of the children was contagious and was also transferred on the adults. With the result that also the “grown ups” wanted to take place on the “hot” seat. After motto „more size = more money“ was raised the voluntary donation for adults accordingly what meant therefore also more money for the kindergarten. At last apprx. 100 rides with children and adults were carried out and at least also the village pastor took the place next to the teamboss. However, it is not delivered whether he has asked before with the big boss for assistance. In spite of the modest weather you can say about 1000 visitors in a village with ca. 280 inhabitants that this was a succesful event. Our appearance was absolutly a small highlight with the result that we went home with an invitation for the next year. By the way, with loading up of the Beetle the sky has risen and we could start the return journey with beaming blue sky. Whether was this the pastor? Success with the home match! Just a few kilometres before the gates of Stuttgart the 7th AvD Rally Baden- Württemberg took place on last weekend (26th/27th of June 09). Sandro Wallenwein and his Austrian copilot had a perfect run with the LPG powered Subaru on this fourth out of seven events of the German Rally Series (DRS – Deutsche Rallye Serie) located in the city of Geislingen. With changing weather conditions they could go along the tempo of the top flight and fight up to the finish for a place on the winner’s stage. Already after three of 14 special stages the duet sat down on Friday evening with the only with alternative fuel powered rallycar on the fourth whole rank. After a short night the participants were torn by a strong thunderstorm from the sleep. Long-term rain provided up to the late morning for extreme aquaplaning on the streets. Before the last special-stage the neon-yellow Subaru laid on the sensational third whole rank. Here Maik Stölzel played the achievement of his very strong Porsche 911 and went behind Rainer Noller and Ulrich Kübler (both on Mitsubishi) on the third rank on the winners-podest. Scarcely hit and still so far in front as never before the LPG-rallye-team was glad about the great order. 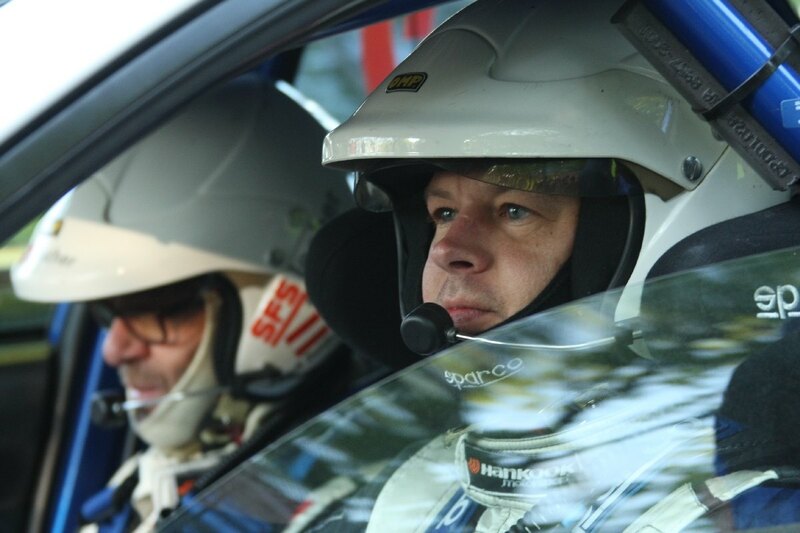 “We are totally happy to be on place 4 at our home-rally” the Tyczka Totalgaz Rallye Teamboss Walter Farkas said. "Sandro has proved which driving class he owns! In spite of the very difficult weather conditions he held permanently contact with our car to the leading teams. Big thanks also to the team of Wallenwein Rallye Sport which has prepared our Subaru perfectly." Within Top 10 – Yes, We Can! On last weekend the 48. DMV Rallye Thüringen advanced to the Mecca of rally sport.Beside the run to the Deutsche Rallye Serie (DRS – german rally series) the predicate of the Euro Rally Challenge (ERC) brought an international starter field with spectacular looking rallycars. In the middle of it Sandro Wallenwein in the LPG powered Subaru Impreza. The beautiful city of Pößneck was traditionally the centerpoint of this event. Within the heart of the Thuringian forest 9 fast special stages on asphalt stood on the programme. A spectacular circuit formed on Friday evening the prelude through the middle of the city centre. Before an overpowering scenery of several thousand spectators the pilots let the earth shake in their group-starts. Glowing brake-discs, long drifts, overtaking manoeuvres and a breathtaking sound kept the fans on the track till far after midnight. After a short night at Saturday morning at 08.oo hrs was the start to further eight special stages in the closer area of Pößneck. At half time Sandro Wallenwein with his hereditary austrian copilote Pauli Zeitlhofer lay in the LPG-Subaru Impreza on the eighth rank. Without slightest problems the successful duet unwound like a clockwork in the afternoon the final kilometres and finished the rally on rank 10 in the overall ranking. “I am glad to finished this rally. Our result is much better than we expected. With 6 WRC, 4 Porsche and numerous strong group A and N cars this rally was taken first-class. Our car is this year on its fourth season and it’s not on latest state of the art. Still we could keep up quite well. With a little slower special-stages and with some gravel parts on the stages I guess a better result might be possible. Concerning the cost for fuel we are absolutly in front.” says the acting german vicemaster says with a smile. “It would be desireable when alternative fuels get also permitted in the German Rally Championship (Deutsche Rallye Meisterschaft – DRM). With a look on the dramatically sinking starter fields, a reduction of the fuel costs of more than 50 percent could contribute absolutly to a stimulation. We believe, in any case, firmly in it and will further speed up this project” team boss Thomas Wallenwein looks into the future. 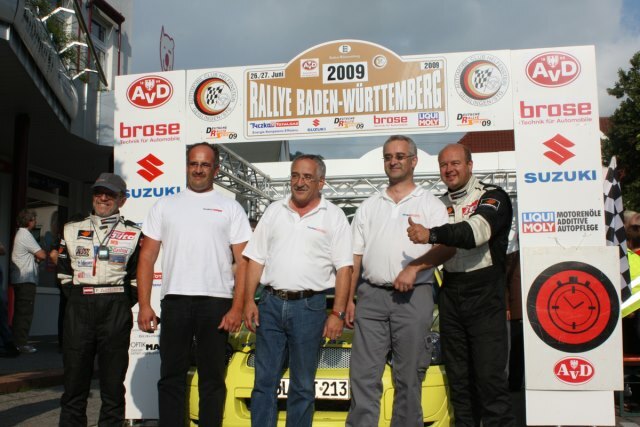 Already in just 2 weeks (26th/27th of June) the next DRS rally, AVD Rallye Baden-Württemberg, stands on the programme. Also here Sandro Wallenwein will roll in the yellow Subaru to the start. “The rally in the “Ländle“ is our home match, and there we want to deliver of course an especially good show“, his fight announcement is. Already on the coming weekend (12th/13th of June) a big rally party rises in Pößneck. It’s probably for the last time that you can watch at the 48. DMV Thüringen Rallye the spectacular World Rally Cars in Germany. As to Group B – times these vehicles are removed next year. Part of this rally is also the present vice-champion of the German Rally Championship (Deutsche Rallyemeisterschaft). Sandro Wallenwein would like to prove the competition ability of the Subaru Impreza powered with LPG on his favorite special stages. „This year the competition is strong as never before. The participants arrive from whole Europe to this event. I know these stages from driving this rally in a world rally car before. At that time I was able to fight with Matthias Kahle for the victory on this competition. Of course this might be not possible this year. But we do not want to hide and show on this very challenging stages what we are able to do with this rallycar. Probably the weather will be for help. Due to the weather forecast we have to expect changing conditions, which will cause slippery stages – which can be for our benefit. Our aim is to be within top 15. Our highest priority is to finish the rally. But as the saying means: Everybody knows that all good things are 3. And this is the third start with this car.” says Sandro, which can’t wait to start at this rally. 130 kilometres on minimum time have to be completed on 5 different special stages. As in the past years one of the highlights will be the visitors roundtrack within the city of Pößneck. Close to the servicepark this 1st stage get started on Friday evening at 22.oo hrs. Further 8 special stages are on the program on Saturday from 08.oo hrs on. Finish of the first car is forseen for 18.15 hrs in the evening. As a tradition on Thursday evening the host has organized a shakedown between 19.oo and 22.oo hrs. Here the competitors are able to make last checks on their vehicles and the spectators have possibility to meet the drivers and get autographs. The same is possible on Saturday on the service area which will be in Pößneck’s “Lutschgenpark”. The Tyczka Totalgaz Rallye Team and Wallenwein Rallye Sport will be happy to welcome a lot of visitors in the service area and hopes that a lot of our fans will cross their fingers for us. You can find more informations about the Tyczka Totalgaz Rallye Team on: www.lpg-rallye-team.de. Informations about the 48. 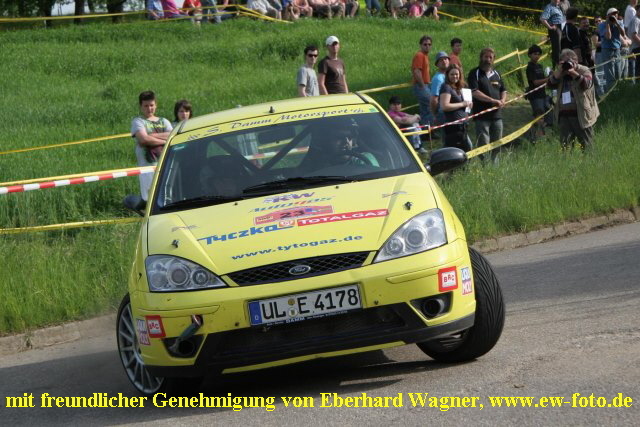 DMV Thüringen Rallye on:www.thueringen-rallye.com. Our sponsor AERYS Performance Parts was one of the organizers of the 2. Free Mountain Race situated in the small village Waldau in the picturesque Thuringian forrest. Moreover we were invited by Alexander Kelber to this event. Due to the defect gearbox after the RallyeSulingerLand we were not able to use the Subaru Impreza for this event. So we decided to activate our "pensioner" VW New Beetle. 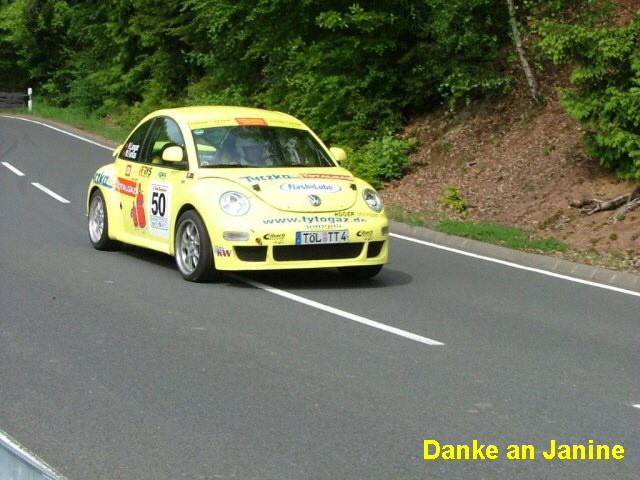 Our team boss Walter Farkas drove the LPG powered Beetle as final car on the 2,5 km long mountain racetrack with 13 curves. It's still a nice experience to feel the enthusiasm of about 4000 spectators on both days when they see our Beetle. It was second-rate that the times of the popular racecar can not be the same as with the competitors in cars with much more horse-power. In any case we had a lot of fun and like to thank AERYS Performance Parts for the invitation. The first application in season 2009 had also our Ford Focus which is powered of course with the reasonable LPG. Martin Baur and Doris Nägel started at the 2. Irmscher Rallyesprint Winnenden. On this occasion, it was a matter of mastering a 7,5-km-long circuit close to Affalterbach for three times. In the most marvellous spring weather, quick curve combinations, a switchback turn and a jump hilltop let arise none boredom with the spectators. For the first time with the new car it took a little while for the duet Baur/Nägel till they learnt to use the car. At least they finished the competition after 22,5 special stage kilometres on rank eight in class 3. Rallye Masters had with 99 participants a high quantitatively as well as qualitatively level. The geographic nearness to Holland and the attractive special-stages lure annually many top teams in the north of Germany. 3rd place. Now we know on which parts of the car we have to make further developments and are glad to look forward to our next assignment with the LPG powered Subaru”, says Sandro after his first rally with alternative fuel. than 100 participants. ADAC Mobile Pegasus Rallye Sulinger Land enjoys at home and abroad an excellent name what gives a lot of guest starters from Holland year after year to the organizers. Lancer. We may be curious as he masters the change on the LPG powered Subaru. decision. We try to keep away from the high curbs and try to finish the rally possibly under the top 5“, says Sandro. Our Ford Focus ST170 had to deny the last years about only very irregular applications with varying teams. Since this was for us a not quite adequate situation, we have thought to ourselves how we can optimally use the vehicle.On the occasion of the Rally Ulm we found out a solution, about we would like to inform. From now on our Ford Focus is attendet and used by the duet Martin Baur / Doris Nägel. The Tyczka Totalgaz Rallye Team leaves the necessary equipment to the to the use of team Baur/Ngel. The vehicle is used mainly with national rallies. We will inform you in usual manner about the respective activities. In agreement and besides rally activities the car can be used for public relation events. We are glad that also our LPG powered Ford Focus comes again for regular applications in rally events. Besides, we can present our sponsors to an even broader audience. We wish Martin Baur and Doris Ngel a lot of success!